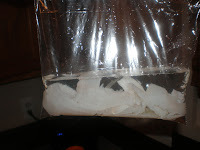 Have you ever had the urge for a fish fry only to pull out your catch and have it be freezer burned? This used to happen to me until I learned a simple trick. Freezing your fish with water will make the fish last longer and not get freezer burned. This is also helpful when catching small fish like perch or bluegills. I primarily fish for perch and don't always bring home a limit. Instead of having a bunch of different frozen baggies, I keep adding to the same one. I will combine my days catch with water in a small sandwich bag and let it freeze. The next time I bring home fish, I will add another layer. Once the bag is full, I will combine it with an actual freezer bag. I like freezing my fish this way. It doesn't matter if I am cooking a fish sandwich or for a big group. I can always pull out the right amount.